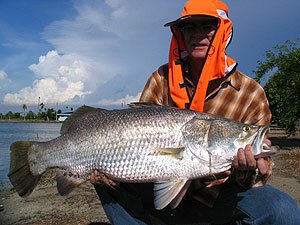 International Sport fishermen and lure fishing enthusiasts visiting Thailand on a fishing holiday with a penchant for lure angling or fly fishing will instantly be drawn to a daily Barramundi fishing trip in Bangkok. Although the Barramundi is not a fish which is indigenous to Thailand it has been widely imported into the country in the last few decades and is farmed extensively in freshwater and brackish water conditions for restaurants and commercial fisheries. This species is held in high regard by sport fishermen throughout the world reaching weights in the excess of 37.5 kg’s and is a formidable opponent on light to medium weight spinning outfits or on the fly. A fishing trip to the highly prolific Barramundi fishing ponds near Bangkok gives the visiting angler access to a selection of well stocked pools offering great sport with weights ranging between two and twelve kg’s. 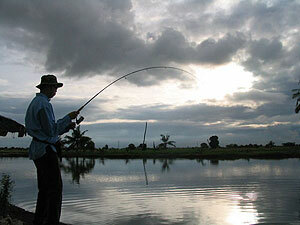 By adopting a roving approach anglers are able to lure fish and fly fish at the various heavily stocked ponds on the complex for the large groups fish. Slowly teasing lures through the various ponds on the Barramundi complex with light to medium weight spinning outfits will see anglers experience fast paced acrobatic sport which can produce up to thirty fish in a single day’s fishing session! Various lures and artificial baits are effective at the Barramundi fishing ponds with Cultiva lures from Owner and Rapala lures regularily scoring big bags of Barramundi from this venue. Our expert team of guides will assist you with your Barramundi fishing throughout the days angling with netting, photography and any technical guidance. The Barramundi complex in Thailand is located amongst a back drop of lush green fields and offers very little shelter from the sun for the visiting angler.Lure Anglers fishing at the ponds are advised to wear a long sleeved shirt and hat and bring a bottle of sun cream. A daily Barramundi fishing trip for this hard fighting species in Thailand is the perfect option for Lure anglers and fly enthusiasts staying in Bangkok with limited time at their disposal for fishing. The complex is ideally located a short forty minute journey from central Bangkok and is suitable for anglers of all skill levels and experience. Fishing for Barramundi at the ponds in Thailand is highly prolific and consistently produces large 15-30 fish hauls of hard fighting fish to all anglers joining us at this venue. Anglers wishing to experience the high octane sport from these hard fighting fish at complex in Ban Pakong will be picked up from their Bangkok hotel by a Fishsiam representative and transported to the venue in an air conditioned minibus.On arrival at the complex the angler(s) will be equipped with a lure angling outfit including a selection of lures and will have the opportunity to fish the numerous ponds which are heavily stocked with this highly energetic sport fish. 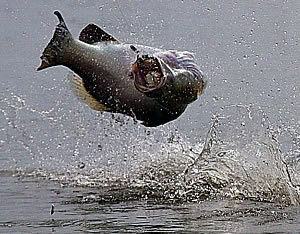 In addition the complex responds well to various fly techniques which regularly yield large bags of this extremely hard fighting sport fish.Anglers visiting the complex can expect to experience non stop action throughout the day with large hauls of this aggressive predatory species being caught on a regular basis. The Fishsiam team has accounted for numerous specimens to ten kilo plus from this highly prolific venue with multiple captures being made on a regular basis.The complex of adjacent ponds is located in Ban Pakong and is short forty minute journey from Bangkok. It is situated in a rural area and surrounded by lush farmlands. The complex is comprised of a series of fifteen ponds covering an area of several acres. The ponds vary in size and depth with varying degrees of difficulty and stocking densities.Basic facilities are available at the Ban Pakong complex with toilets and an on site restaurant serving a modest selection of Thai food. The duration of our Barramundi fishing trips to the Ban Pakong complex is approx six hours excluding traveling times with the early afternoon period being the most productive time.Whilst fishing at the numerous ponds on the complex the angler(s) will be guided by one of fishsiams top pro-guides who are highly experienced lure anglers. At the end of the days Barramundi fishing the angler(s) will be transported back to their Bangkok hotel by air conditioned minibus. 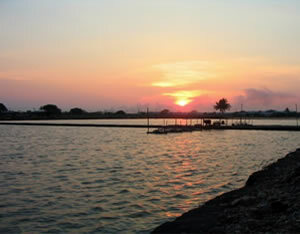 Fishsiam offers daily trips at the complex in Ban Pakong. In addition trips to this venue can be combined in our tailor made packages which are designed to meet the specific requirements of the visiting specialist angler. This venue is suitable for both novice and experienced anglers who all will enjoy the high octane sport offered at the complex.Please note that there are only limited facilities at this complex and it is advisable to bring water and lunch with them prior to arrival.